The historic nature of the moment when the decommissioning of the IRA's weapons was announced should be recognised. To hear the head of the Decommissioning body, Canadian General John de Chastelain say: "We are satisfied that the arms decommissioning represents the totality of the IRA's arsenal" was quite something. It does not put an end to arguments about a united Ireland. But it should put an end to major violence. There will be those who still express their doubts, but one of the most skilled urban paramilitary organisations of modern times has laid down its weapons, having accepted that its armed struggle could not bring the six counties of Northern Ireland ("The North of Ireland" as the Republicans always call it, implying that Ireland is still one country) into a united Ireland. It was, in the end, not so much the British the IRA failed to beat as the unionist people of Northern Ireland who did not and do not want to break their ties with Britain. Without a warm sea in which to swim, the IRA eventually had to admit the end had come. Instead, it converted its campaign into political gain and of course eventually hopes to win through the ballot what it failed to achieve with the bullet. That must be a long-distance hope as things stand and there is a fringe which will still seek to win with the bullet. But here is the lesson for guerrilla groups across the world. You can fight to win if you want and some will win (the African National Congress won in South Africa when the white minority conceded) but sometimes victory is not possible, so the fighting has to end and the politicking has to begin. This happened in El Salvador where a vicious civil war raged for years during the Eighties and Nineties before both government and rebels realised neither could win outright and came to an agreement. It is surely vital for this day not just to be recognised but to be seized. We have been down a similar if narrower track before and there are lessons to be learned. Between 1956 and 1962, the IRA waged a campaign along the Northern Irish border. It was a much smaller affair. The IRA was short of weapons. I remember our school cadet armoury, in distant Sussex, having to be locked all the time in case of an IRA raid, though we wondered why the IRA would want our World War I vintage Lee Enfields. One also remembers what happened when the IRA gave up that campaign. Nothing happened. The Catholic or Nationalist minority in Northern Ireland did not get a fair deal and the seeds were sown, as they often have been in Irish history, for a later generation to seek redress. This time, if equality of esteem and equitable power sharing is not achieved, it is not inconceivable that in another generation or two, another round of violence could begin. And of course, there has to be a full disarmament by the loyalist groups as well. To those of us who reported in the 1970s on the anger in the streets of West Belfast and Derry (Londonderry as the Unionists call it - when the war of names ends, so will the underlying conflict), it is amazing that it has ended this way. And some will wonder if it has really ended. This after all is a conflict that has been going on for more than 800 years, ever since the English started their invasions of Ireland and particularly since the 17th Century when Cromwell dispossessed Irish Catholics, and Protestant landlords and settlers arrived. For generations, Irish men and women have dreamed of having a united country free from British rule. 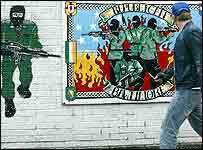 Rebellions have broken out at regular intervals and even after 26 of the 32 counties won independence from Britain in 1922, the IRA still battled to bring the six counties of the North within a united Ireland. It often seemed, that however the rest of the world had changed, the conflict in Ireland had not. Perhaps its real significance is that in a world where borders and nationality matters less - and certainly this is true within the European Union - minorities will be less ready to take up arms and majorities will be more ready to accord real rights. It doesn't happen everywhere of course. The Balkans broke up because that equation did not work. It is not happening in Chechnya. But the world has also moved on - to the global conflict launched by Islamists of al-Qaeda. These are people who scoff at the nationalism of the IRA and ETA and who scorn any attempt to limit civilian casualties. And they are not interested in politics.